Choose products and aromas like Aveda, that care for you and the Earth. Aveda is one of the largest purchasers of organic ingredients in the personal care industry. Our ingredient philosophy is what you put on your body should be as healthy and natural as what you put into it. If Aveda can develop ingredients using oils instead of crude oil and natural gas, they do.The curl enhancing-and straightening- lotions are infused with organic marshmallow root and flax seed. Hair sprays? Air infused technologhy propels them. Aveda much- loved shampoos and conditioners can wake you up ( with Rosemary Mint) or calm you down ( try Shampure ) with complex natural aromas that turn a shower into a transporting sensory experience. 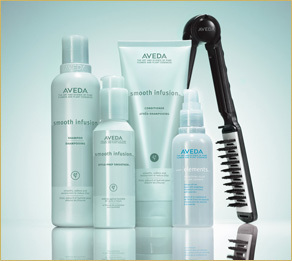 Better feeling are possible because only Aveda hair care has Pure-fume ( Aromaology ) for the rest of you. Plant aromas that change your mood as you change your hair. Only from Aveda : formulas at least 97% naturally derived , based on a patented green tea technology that eliminates unnatural tones. Enhancing hair's well-being with conditioning sunflower, castor and jojoba oils for essentially damage-free results. Awaken to a fresh palette inspired by nature; from the most healthy-looking blondes to lustrous red and burnished browns. Full spectrum hair color is created for customization and offers unlimited shadre possibilities. Let your colorists choose the one that' right for you. Your skin is utterly impressionable, an outer mirror to your inner self. Which is why Aveda created skincare that harnesses the life force of nature: pure flower and plant essence that are also living, Aveda skincare is an extraordinary blend of art and science that works in harmony with your system to nourish and restore balance. Nut-seed pigment from Brazil, cinnamon from India, roses from Russia: these pure naturals are infused into Aveda colors for face, eyes, and lips. Discover shades as subtle as Opal eye shadow, as grounded as Maple lip liner, as vivid as Juneberry lip color. 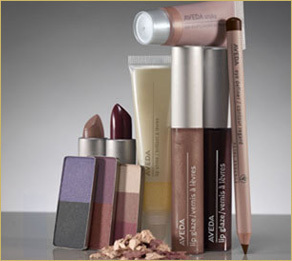 Shades that reflect the full range of nature's wonderous palette, and formulas that actually care for you.